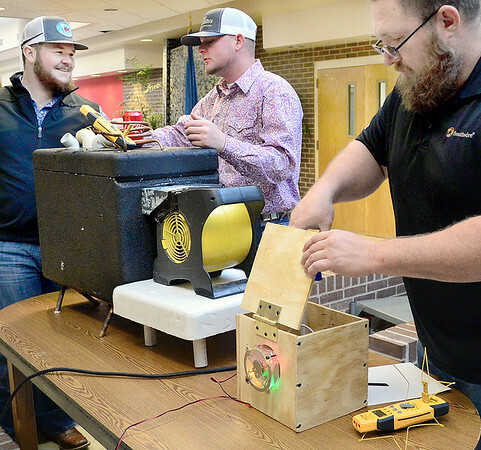 Kiamichi Technology Center Heating Ventilation and Air Conditioning Technology students pictured from left, Jeffery Neering, Dustin Rowton and Russell Moss prepare their units for a class contest Thursday. The KTC HVAC career focus is to create comfortable environments by colling and heating the interior of residential and commercial buildings. Use advanced energy efficient technologies adn equipment in response to increasing global energy demands and to design, layout and fabricate sheet metal ducts and wide range of environmental components. The units will be judged by students from KTC on presentation along with technical asspects like tempeture produced by the student made units.